Won’t you hand-make yourself Tofu, a Japanese indispensable ingredient for Miso-soup, salad, simmered dish, etc.? Shall we enjoy freshly made Tofu, while learning nutritious powers of soy beans of the material? 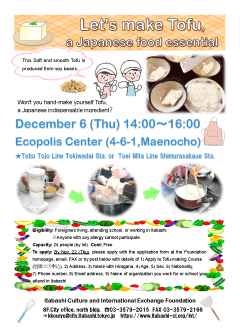 Foreigners *Anyone with soy allergy cannot participate. By Nov. 22 (Thu), please send the application form below. In case you apply with this Form, we will send you an email notice of “Your application is completed”. In the absence of our reply, please call 03-3579-2015, Itabashi Culture and International Exchange Foundation. If you restrict to receive unknown mails including the domain of “@itabashi-ci.org”, please remove the restriction of our domain on your computer, Smartphone or cellphone so that you can receive our reply. A professional expert teaches you dance in a polite and gracious manner to beginners of foreign residents. On the final day of the lessons, you will perform the dance dressed in kimono on stage! No need to worry even if you are not good at exercising! Let’s enjoy Japanese culture together! Applicants need to participant in all of the lessons. Regardless of Age or Gender. 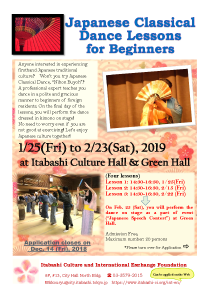 Anyone living in or outside Itabashi City can apply. By Dec. 14 (Fri), please apply with the application form.